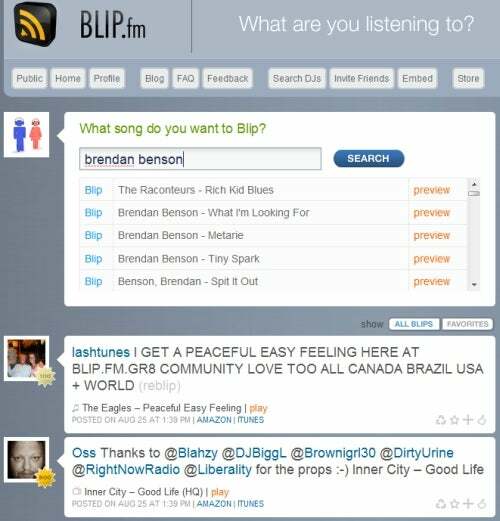 Blip.fm is like Twitter for music, but many aspects of the service are confusing. If Twitter and Last.fm hooked up for a drunken night of "social networking" (heh, heh), nine months later you'd get Blip.fm. Seriously, there's no mistaking the genealogy: It looks almost exactly like Twitter, but it plays music much like Last.fm. Trying to describe Blip.fm beyond that is tricky, as it's not immediately obvious what the service is for. Once you've signed up (it's free), you see a decidedly Twitter-like list of other users' song picks, each with a short comment. Twitter calls these tweets; on Blip.fm they're "blips." You can click a blip to play the associated song; follow the DJ (i.e. user) who blipped it; and give "props" for choosing that song. To blip a song of your own, just search for it and add a Twitter-length comment. That adds your blip to the site's ever-scrolling list. Of course, ultimately you'll want to follow your friends and "friends" while attracting followers of your own, the idea being to share your musical tastes. I have to say, I'm not sold. Though I'm intrigued by Blip.fm's play-any-song-on-demand capabilities, I don't know if I really see the point of the service. To me it seems unnecessarily confusing, and the DJs it initially paired me with don't seem to have anything in common, musically speaking. Admittedly, I'm not a big Twitter fan, either, so maybe I'm not the right audience for this. If you want to expand your musical horizons by way of friends and/or strangers, Blip.fm gives you the tools.